Please contact Andrew and Andrew if you wish to be an ACTIVE participant of this INDEEP WG. Following three directed workshops and informal discussions within this WG, a series of manuscripts have been produced that have increased our understanding and visbility of the ecosystem functions and services provided by the deep sea. These will hopefully influence future science and will also provide tools for stakeholders. A review article that summarises deep-sea functions and how they link to the diversity of services provided by the earth's largest habitat. In addition to identifying and quantifying the services provided, we couched this review in a management framework to make it more useful for stakeholders. A key point of the resulting manuscript discusses how the vast size of the deep sea and relatively slow processes together result in a habitat whose services must be managed with a much broader view of time than shallow marine and coastal habitats. A second question we aimed to answer is how the habitats of the deep sea will be impacted by climate change. To do this we used the 31 most current climate models that are part of the 2013 International Panel on Climate Change (IPCC) report to quantify the extent of the globe’s ocean that would be impacted by O2 decrease, increases in temperature, decreases in pH, and changes in the amount of food getting into the ocean (i.e. production). We discovered that approximately 98% of the oceans were predicted to be impacted by multiple of these stressors by the year 2100. Furthermore, when mapping where the communities occur, we found that between 400 and 800 million of the poorest people in the world that are also dependent on the ocean would be among those impacted by multiple stressors. While this is an important finding, what is potentially most remarkable about this manuscript is that we have integrated deep-sea habitats into a global comparison of areas impacted by climate change. The results highlight how studies need to quantify how multiple stressors rather than singles stressors will impacts the services that our oceans provide and that special attention needs to be paid to soft-sediment and hard-substrate habitats at slope and shelf depths and submarine canyons as these areas are likely to be among the most impacted of the marine environment. Through this, we have integrated both deep-sea habitats into our general view of the function of the globe but also identified in what manner they are likely impacted. This paper was published in the prestigious open-access journal PLoS Biology and was accompanied by a companion piece making it more approachable to the general public. The paper and its companion piece were the result of a meeting called CLiDEEP led by Drs. Andrew Sweetman (International Research Institute at Stavanger, Norway), Andrew Thurber (Oregon State University, USA), Lisa Levin (Scripps Institution of Oceanography, USA), and Craig Smith (University of Hawaii, USA) at the Friday Harbor Laboratories, which brought together 23 scientists from 18 institutions and 8 countries to discuss how climate change is likely to impact the worlds deep oceans over the coming century and was largely funded by the Norwegian Research Council facilitated through INDEEP interactions. Dr. Camilo Mora (University of Hawaii, USA) led the paper and provided the impetus to integrate the climate and populations models including both shallow and deep habitats. A follow-up paper, expanding on this relatively short-form manuscript and focusing on the deep-sea habitats and the biological impacts, is near submission, and is being led by Dr. Sweetman. A fundamental lack of understanding about ecosystem goods and services in the deep sea is created by scientists using inconsistent study designs and sampling protocols around the world. As we do not know how homogeneous the deep sea is, we lack the ability to apply the results across regions. However, drastic reduction in molecular sequencing costs and the time required for sample preparation and analysis has created an avenue for global comparisons of ecosystem function by focusing on microbial community analyses. Microbial communities mediate or facilitate the reactions that together create a large portion of ecosystem function and can be analyzed from frozen sediment, a type of sample that is collected in most research studies and remains stable in freezers for long periods of time. Through the analysis of frozen sediment lying in many INDEEP researchers freezers, we have applied Illumina MySeq methods, which allow sequencing 250 bp paired‐end reads that are linked to create 500bp sequences of a hyper‐variable region of the 16s rRNA gene. Because of its relatively low cost, Fondation Total provided INDEEP with funds to analyse hundreds of samples to a depth of 83k sequences per sample, providing an excellent coverage of the communities present around the globe, identifying their likely functions using specific gene approaches, and avoiding the high cost of fieldwork. In addition, we have developed a cost‐ and time‐effective technique to quantify ecosystem functioning in benthic habitats, which can be employed on future cruises. By developing standardised methods and providing the necessary equipment for already‐funded cruises, we aim to create a global understanding of deep‐sea ecosystem functioning that has, so far, not been assessed. The results will be published in a synthesis paper at the end of the second phase of INDEEP. 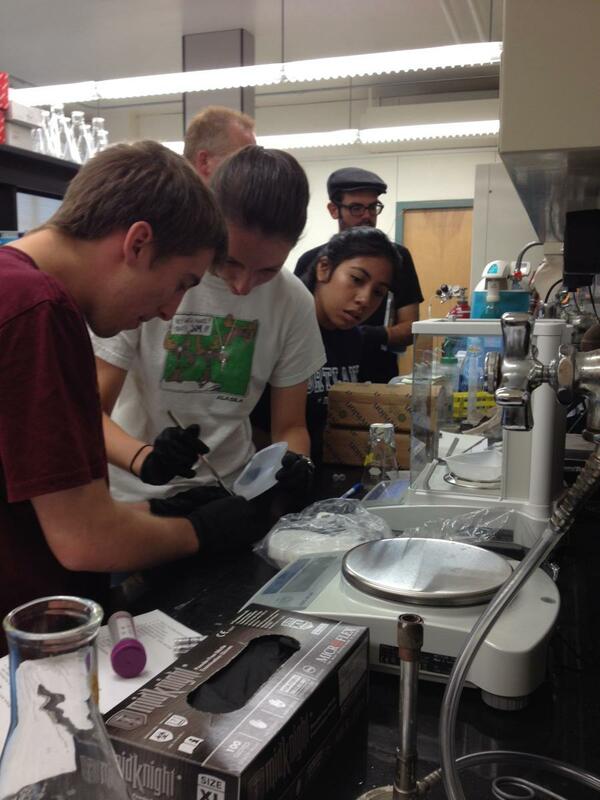 Fig.1: Undergraduates working together to learn how to extract DNA from sediment. 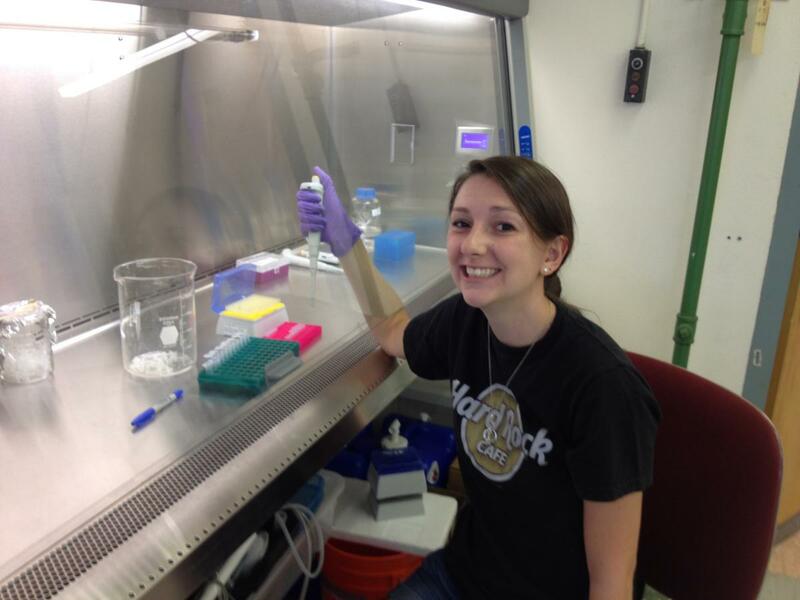 Students include Tuesday Simmons (2014 REU Undergraduate instrumental in the Freezer Project, Marshall University Student), Daisy Castillo (2014 REU, University of California, Santa Cruz Student), and Oregon State University Undergraduates: Matthew Borchers, Kyle Neumann, Johannes Vielbig. Credit: A. Thurber.